The ASK Justice project seeks to contribute to positive policy change to increase access to medicine (A2M) and access to knowledge (A2K) in Africa. To this end, ASK Justice aims to build a strong network of academics at Southern and East African universities that collaboratively engages in research, teaching and outreach activities at the interface between human rights and intellectual property (IP) laws and policies. The network analyses the impact of IP on access to learning materials and access to medicines through a human rights lens; creates capacity for participating scholars to co-create and adapt IP and human rights curricula; and engages with relevant international, regional and domestic policymaking bodies. Importantly, we strive to equip civil society with research-based human rights analyses of IP reform processes in Botswana, Kenya, Uganda and South Africa. Moreover, it is a key objective to integrate our findings into teaching curricula as well as general debates and discussions concern A2M and A2M by policy makers, civil society and higher education institutions. Network members are involved in three distinct but overlapping activities: policy research, teaching development and outreach. 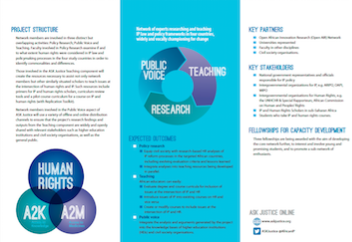 Network members involved in the outreach aspect of ASK Justice will use a variety of offline and online distribution channels (from workshops to print media op-eds to twitter and facebook) to ensure that the project’s research findings and outputs from the Teaching component are widely and openly shared with relevant stakeholders such as higher education institutions and civil society organisations, as well as the general public. More information about the ASK Justice project can be found on the project’s website. ASK Justice tweets at @AfricanIP .